Duc designed this innovative and intricately constructed work to celebrate his father’s birthday. It features strong form, texture and repetition. Pinning and layering techniques are used to create further interest with textures. 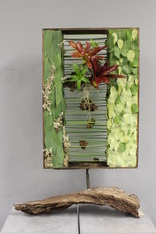 Plant materials used were flexi grass, banksia and eucalyptus leaves, tillandsia and bromeliads and moss. Duc chose his materials for their symbolic meaning. The rectangles within the design were chosen for their strong shape and to represent the consistency a father brings to a child’s life. The gum leaves for the strength of a father who cares for his children; the flexi grass stems forming links between the two rectangles representing father and son. Suspended among the flexi grass are chunks of termite nest representing the tears shed when a father departs. The red bromeliads are the focal point, creating a ‘resting area’ amidst the repeated horizontal lines of flexi grass and to signify brightness,happiness and peace. Duc’s design is also suited to corporate work and can be modified for different purposes by replacing the bromeliads with different focal materials.